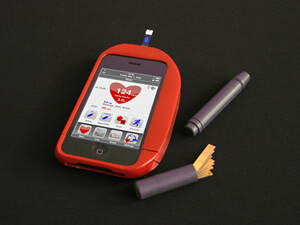 DiabetesMine, with the sponsorship of the California HealthCare Foundation, an independent philanthropy devoted to improving health care delivery, is sponsoring its second annual Design Challenge, calling for innovative devices or web applications that will improve life for people with diabetes. The three top concepts will each receive cash awards and support to further the commercialization of their designs. If you are one of the 21 million Americans with diabetes, or you live with a diabetic, then you are familiar with the care and lifestyle concerns involved with this disease. Special diets, limitations to exercise, insuring proper blood circulation, blood sugar testing, insulin shots, blood pressure monitoring, and being on the alert for vision and other sensory changes are just some of the rituals that diabetics incorporate into their otherwise regular lives. Lifecase & Lifeapp SystemDiabetesMine, a web resource and network for diabetics, continues its search for technologies that will make living with diabetes easier. Ideas can come from patients, parents of diabetic children, design, medical, and engineering students or professionals, or anyone else with knowledge of the disease that can come up with an ingenious groundbreaking concept. Last year's prize went to two students at Northwestern University that created an iPhone interface for complete diabetes management, integrating control of glucose meters, insulin pumps, and logbooks into one application.